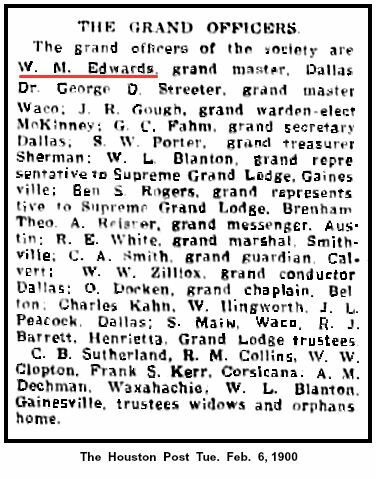 Judge William M Edwards is inscribed on the pages of pioneer history of jurisprudence in Dallas County as one of the few remaining pioneer lawyers who took up their work in Dallas before the arrival of the railroads. After reading law at Columbia Tennessee and admitted to the bar in 1866 he began practice at Centerville the county seat of Hickman county and from there came to Dallas in 1871 just prior to the completion of the first railroad to this place Judge Edwards began practice here in that year and was soon accorded a prominent position at the Dallas county bar. From 1874 to 1875 he was the city attorney of Dallas. From those early days until 1898 he continued in the general practice of the law resigning only in that year to become a justice of the peace an office to which he has ever afterward returned by re election until 1908. In this capacity Judge Edwards has given eminent satisfaction to both bar and litigants and is known as a model dispenser of justice He is a native son of Maury county Tennessee and was reared and educated in Nashville there also preparing for the law. He married in Hickman county Tennessee. Miss Elva H Gray who died in Dallas in 1904 after becoming the mother of the following children Walker G, Alfred George, William M Jr. Mrs. Elizabeth Lawther and HP Edwards. 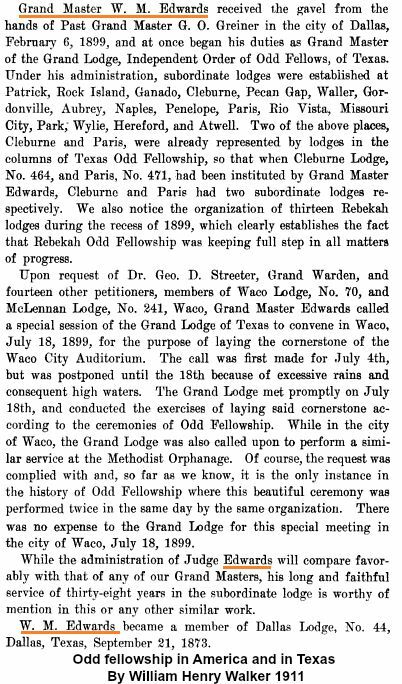 Judge Edwards has for many years been prominent in the councils of the fraternal lodge Independent Order of Odd Fellows and is a past grand master of the state of Texas having filled that office in 1899. Source: A History of Greater Dallas and Vicinity, Volume 2, By Philip Lindsley, Luther B. Hill, 1909.